As the year comes to an end, people have their missions and visions all lined up. Well, this is a leap of faith knowing that everything would fall into place as expected. For Vrishabha natives, they have high hopes that 2018 would be a year of blessings for them. Undeniably, from what Vrishabh Rashifal 2018 predicts, the signs are good for these people to experience true happiness in their lives. Continue reading to get succinct information regarding what 2018 holds for you. In terms of Vrishabha Rashi careers, the cards favor the fact that these individuals would thrive in the better part of the year. The start of the year would however be tough for you guys. This is because you would have some unresolved issues from 2017 that you would carry to this year. Regardless, all this shall come to pass foretells the 2018 Varshik Rasifal. You will find fulfillment in flourishing businesses that you would be handling. It would appear as though everything you touch would definitely succeed. This is a reason to celebrate more so at your workplaces. 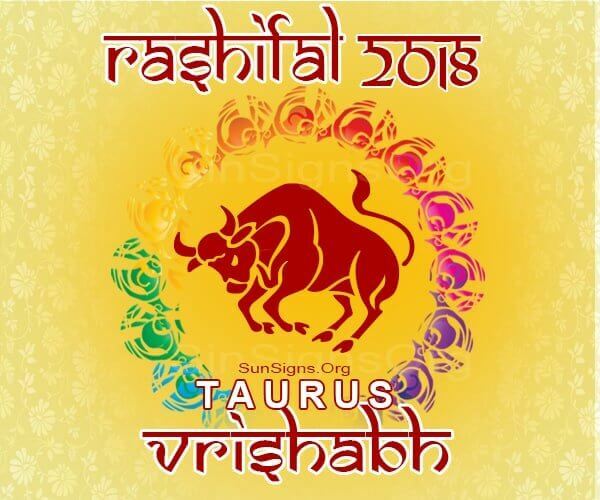 The Vrishaba 2018 Rasifal foretells that financially, you would be smiling right from the beginning of the year. In 2018, the Vrishabha individuals would be lucky when it comes to their finances. Your career success would somehow be attributed to the good cash inflow that you would be witnessing during this season. Regardless, you are advised to seek financial assistance on how to wisely invest this money. This would not only help you but it would secure your family’s future. Regarding love, there are signs that Vrishabh Rasi would fare averagely in this sector. Those that are already married would be happy all year long. Your family lives would be a reason to work hard at work and in any income generating activity that you might indulge yourself into. The birth of a child too is on the cards for the bulls. Other romantic Vrishabh Rashi relationships would also work well. Those around you would appreciate the warm love that you would be bringing on the table. This is one of the main reasons why they would feel obliged to respond to the honest love that you offer. Dating Vrishabha couples would however experience some months of ups and downs. This is because they would tend to disagree with their lovers. When this happens, it is recommended that you give each other some space. This gives both of you a reason to think over the love that you share. Unfortunately, the Vrishabha people might go through a series of health issues in 2018. This is an occurrence that would really discourage you from engaging in you routine activities. Nonetheless, this would easily be solved with the right meals on the table. Consequently, you are strongly advised to adopt a healthy eating plan throughout the entire year. Above all, hitting the gym regularly might be an option for the Vrishabha Rashi in 2018. The Vrishabh Rasi 2018 forecasts that traveling would ignite you into a happy mood that nobody has ever seen before. Your partners and family friends would constantly encourage you to travel so as to be happy. This is an activity that you would be happy to do. Surprisingly, you would not feel the pain of paying for an expensive ticket as long as it brings joy to your life. This rejuvenated interest in traveling would welcome new opportunities to your life. Thus, it is important that you travel to the best destinations in the world. When things are good for the Vrishabha natives, they would be really glad in 2018, forecasts the 2018 Vrishabh astrology horoscope. Nevertheless, they would also experience moments of low moods as their health might put them down. This is a challenge that you should eat right and remember to love those around you. Truly, it is a good season worth spreading the love.